"The United States Army (USA) is the largest branch of the United States Armed Forces that performs land-based military operations. It is also the largest overall and oldest established branch of the U.S. military, and is one of seven U.S. uniformed services. The modern army has its roots in the Continental Army which was formed on 14 June 1775, to meet the demands of the American Revolutionary War before the establishment of the United States. The Congress of the Confederation officially created the United States Army on 3 June 1784 after the end of the Revolutionary War to replace the disbanded Continental Army. The army considers itself to be descended from the Continental Army and thus dates its inception from the origins of that force. The primary mission of the army is "to fight and win our Nation’s wars by providing prompt, sustained land dominance across the full range of military operations and spectrum of conflict in support of combatant commanders." 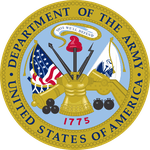 The army is a military service within the Department of the Army, one of the three military departments of the Department of Defense. The army is headed by the Secretary of the Army, and the top military officer in the department is the Chief of Staff of the Army. The highest ranking army officer is currently the Chairman of the Joint Chiefs of Staff. During fiscal year 2011, the Regular Army reported a strength of 546,057 soldiers; the Army National Guard (ARNG) reported 358,078 and the United States Army Reserve (USAR) reported 201,166 putting the combined component strength total at 1,105,301 soldiers." Source: Wikipedia, "Unites States Army", available under the CC-BY-SA License.